Al Aqsa Foundation unhappy with Bayit Yehudi tour of Hevron. The website of the Al Aqsa Foundation, an organization that operates legally in Israel, describes last week's visit by Economics Minister Naftali Bennett and the Bayit Yehudi faction to Hevron under the headline, "Bennett Defiles al-Ibrahimi," using the Muslim name for the Cave of Patriarchs. 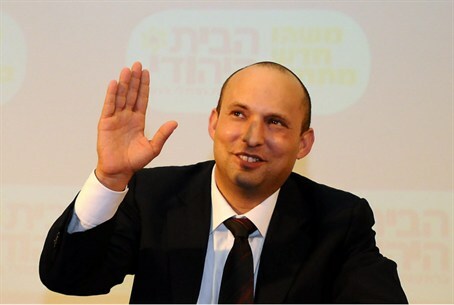 The report cites a group called "Youths against the Settlements" as saying that Bennett's visit, alongside "radical settlers, was "a step that expresses escalation, provocation and indifference to Muslim feelings." Arutz Sheva's Dalit Halevy reported that the Islamist organizations see visits by Jews to places that are also holy to Islam as defiling those places. The Islamist website also reported that the IDF did not allow the Arab governor of Hevron to enter the Cave in order to pray. The Palestinian Authority (PA) governor called this "a harsh violation of the freedom of religious practice."